There’s a big amount of interest in two upcoming Motorola devices for Verizon. We’ve been following the rumors and news about the Droid Turbo 2 and Droid Maxx 2 and seen leaked specs and more. Now a leaked pamphlet has shown some more information and also given trade-in prices for those who want to hand in their current smartphone and get one of these new Moto smartphones. Just a few days ago we reported that the Droid Turbo 2 and Maxx 2 were to be unveiled at an event on October 27. Invitations have already been sent out for the Verizon and Motorola event where we’ll see the unveiling of the new Droid smartphones. Now a pamphlet for the devices has leaked. This shows a trade-in price of up to $300 for your current smartphone if you want to trade up to purchase the new Droid Turbo 2 or Droid Maxx 2. 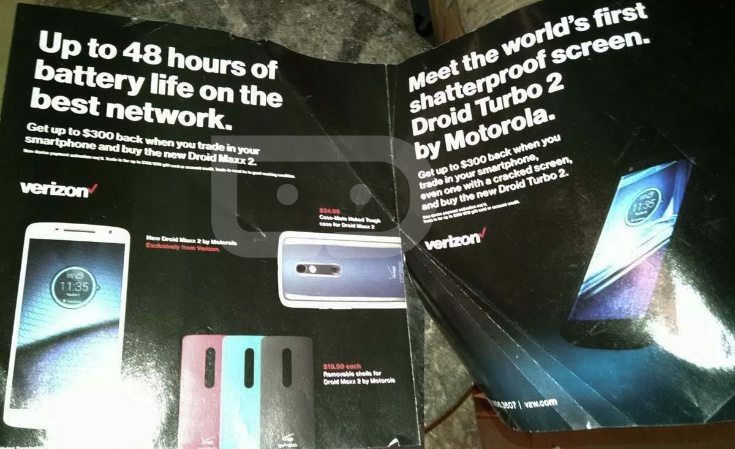 Other snippets gleaned from the pamphlet are the “world’s first shatterproof screen” for the Droid Turbo 2, as previously rumored. Interestingly the trade-in details for the Turbo 2 say that even a device with a cracked screen will be accepted. A further page shows details for customizing the Droid Turbo 2 with Moto Maker. This page says that those buying the 64GB variant of the phone can get one Moto Maker design refresh. 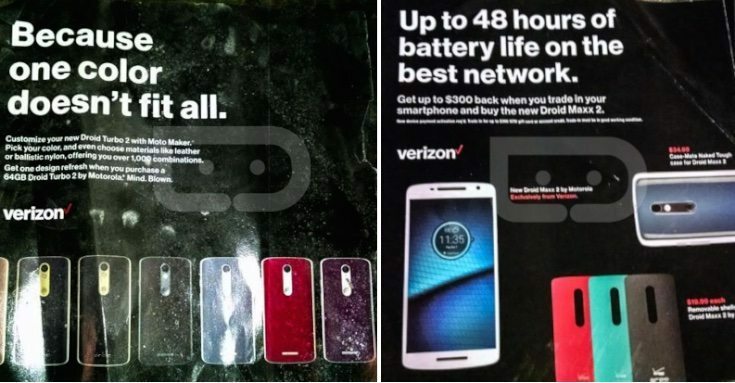 Another boast from the leak is the touted 48 hours of battery life with the Droid Maxx 2 on the Verizon network, and this also shows swappable back covers in black, green, and red. We’ll remind readers that the Droid Maxx 2 is the Verizon variant of the Moto X Play with a focus on battery life. The Droid Turbo 2 is a higher-specced phone, and unofficial specs include a Snapdragon 810 processor, 5.5-inch display with Quad HD resolution of 2560 x 1440, 3GB of RAM, and 32GB and 64GB models for internal storage. Other rumored specs are a 21-megapixel rear camera, 5-megapixel front-facing unit, and 3760 mAh battery. It’s not long until October 27 will be upon us and we’ll be able to bring you details on Droid Maxx 2 and Droid Turbo 2 prices, confirmed specs, and hopefully release dates. Do you already have one of these new Motorola Droids for Verizon firmly in your sights? If so, is it the Droid Turbo 2 or Droid Maxx 2 that you’re after? Send your comments to let us know.